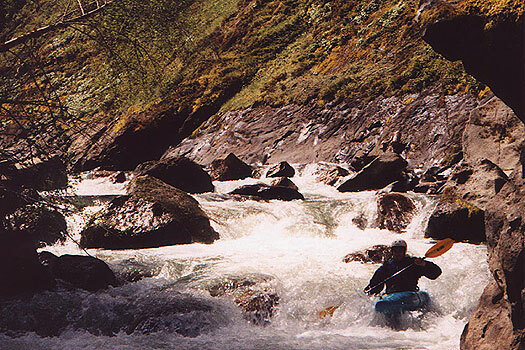 Copyright © 1999, Oregon Kayaking. No part of this page may be reproduced, linked, or copied without the express written permission of the Author. Mike careens through one of the many fun boulder gardens on the upper section. We put in and ran most of the upper mile pretty quickly, only stopping to scout one long boulder garden that ended with a blind twisty drop around a sharp boulder. Gabi runs the final drop in the first long boulder garden. Dustin in the middle part of the gorge. 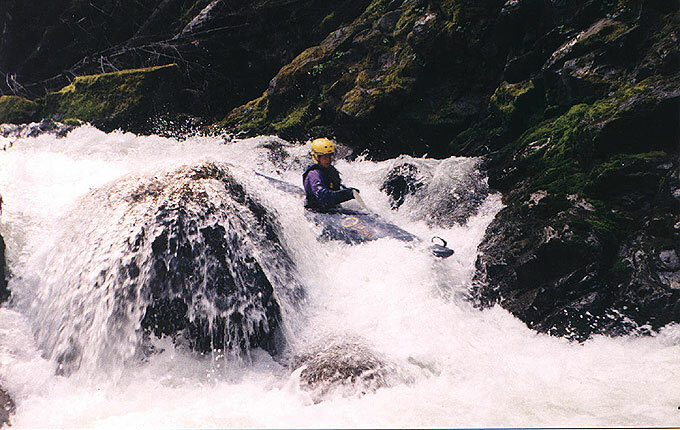 Below the gorge the creek widens considerably and is characterized by long stretches of class III interspersed with several fun microgorges and a couple of tough class IV ledges. 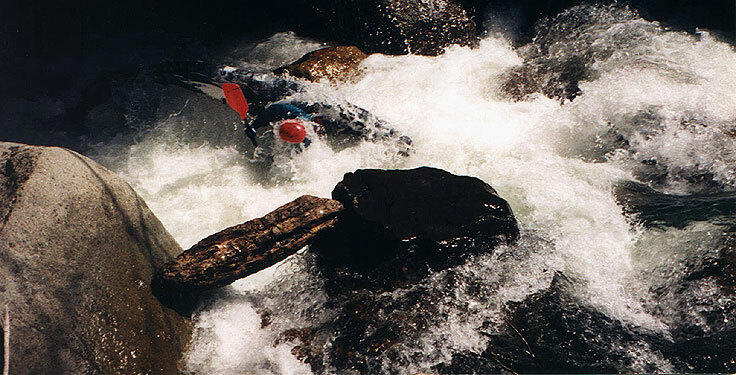 The biggest drop below the gorge is after one of the first little microgorges and is the largest single drop on the run, a solid class IV ledge that we have never been able to run. There is an large old growth tree wedged at the top of the ledge that blocks the best line. The portage is up over the hill and there is poison oak in the spring, so watch out for it. Below here is easier water to another 3+ ledge that has a large log blocking most of the runout fifty feet downstream. A quick roll is useful here. Below here paddlers need to keep an eye out for UV, a pair of six foot ledges a mile above Cover Camp. The first U-shaped ledge is no problem but the runout from this one pours into a really nasty V shaped ledge that we always sneak on one side or the other. From there the creek is really mellow all the way to Cover Camp. Mike plunges into the first ledge on UV. The last big drop (Buffy the Vampire Slayer) occurs soon after going under the FS30 bridge. As the stream curves back left, you drop over a small ledge bisected by a large fallen tree. Below here the creek descends over a larger ledge and plunges into a unique dagger-shaped rock that protrudes from the left wall and points upstream at chest level. Most of the water is flowing into this rock, so be careful here as it has pinning potential. This drop surprised Gabi; she was boatscouting the drop and ran into the 'dagger'. 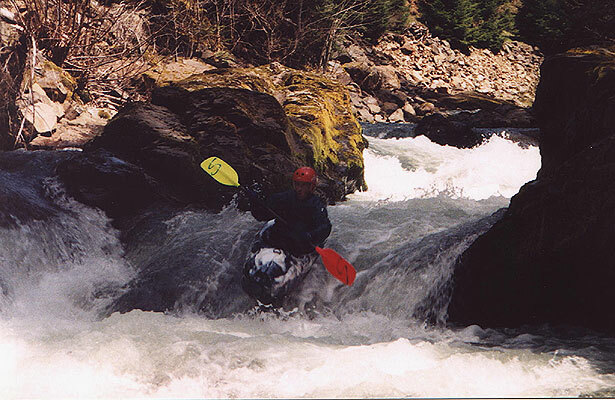 Although she missed wedging, she hit the "tip" of the dagger hard on the left side of her chest, fortunately in her PFD. This not only knocked her over but also knocked the breath out of her. A quick roll saved the day. Below Buffy the creek is mellow all the way to Cover Camp. HAZARDS: The gorge and the four drops mentioned. Careful scouting in the gorge is a must as logs could block any channel. Logs were a problem for the entire run. ACCESS: After turning off S Umpqua Road, drive up FS 29 for about 12 miles to Cover Camp, the take out. Get back on FS 29. Parallel the creek for about 7 miles, or until you find a good place to put in. 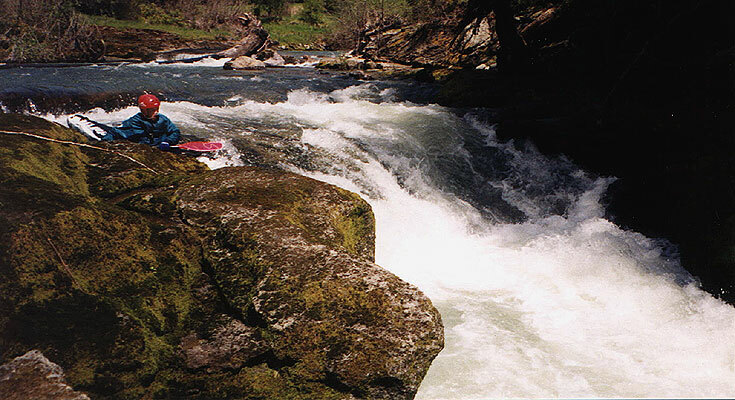 GAUGE: Based on the size and drainage of Jackson Creek, we estimated the flow on the upper section to be about 8-10% of the flow of the South Umpqua at Tiller. An absolute minimum flow would be 1200 cfs at Tiller; 2000 cfs would be a great ride. 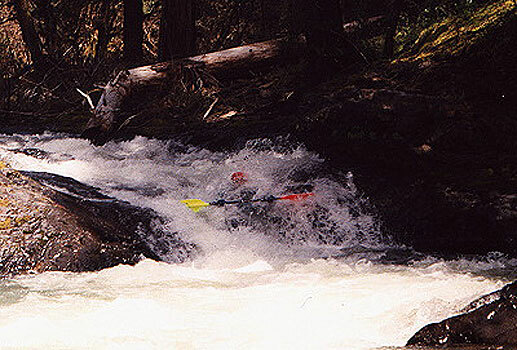 The flow graph linked here is generated by Pat Welch on his Oregon flows Page. Thanks Pat!